Set an eye over Themes untill you get the 1 or 2 or 3 that really suits Apt for your App or the one which was in your picture "how it should be". There are some who goes with things that they get and some hunt till what they need, there are so many themes out there.., but Wordpress Themes are one that reliable and secure, no second thought. The 1000 pixel wide, two features Business Theme WordPress 3.0 widget, seven zones have an option page with the help of one on the bottom of the theme of any HTML code, banners, etc. can add. 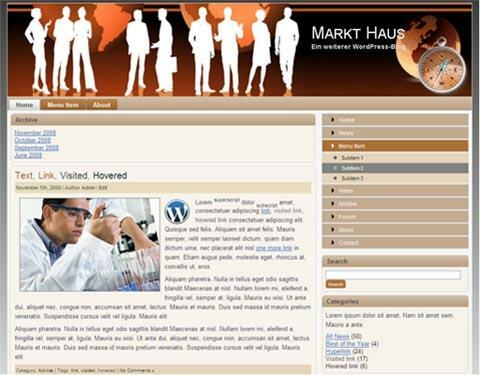 The sidebar is 300px wide, ideal for 300xw50Pixel Adsense advertising format. The Bussiness theme is already prepared for language files. Various translation file, among other things deusch and English are already in the zip package here. In the footer of the theme up to 4 text widgets can be placed. Other widget positions over and under the posts. Any other languages can be downloaded from wordpress.org down. 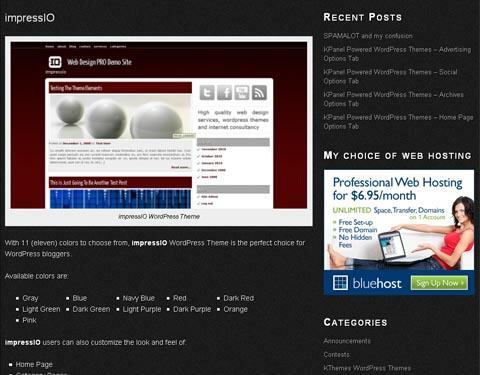 With 11 (eleven) colors to choose from, impressIO WordPress Theme is the perfect choice for WordPress bloggers. Supporting both WordPress thumbnails and TimThumb, impressIO offers state of the art thumbnailing solutions. With impressIO WordPress Theme it is easier than ever to socialize. Your readers will become your friends or followers with just a few clicks. They can also share your posts with their friends with the help of all Social Bookmarking sites supported by impressIO. impressIO WordPress Theme can also make you money. Integrated advertising support turns your WordPress blog into a money making machine. Mwendo is a child theme based on the widly popular Motion. 1. Motion is just so darn beautiful as a theme! 2. We saw one of our friends try set up DukaPress using Motion but the fact that it is a dark theme gave him some problems, so we decided to make a child theme with all the relevant CSS modified to work with this beautiful dark theme. We also hope that Mwendo serves as a nice example on how to make your own DukaPress theme – it is very easy because DukaPress includes lots of CSS “hooks” which allow it to be styled however you want it. 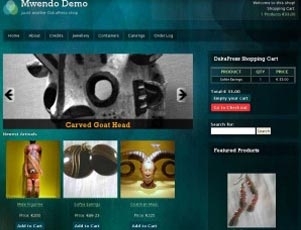 Look at what we did under the hood in Mwendo and you’ll see – pay particular attention to functions.php and style.css. Have fun!